Temple Sholom is a warm, welcoming place that feels like a second home. It is a place where people can go to be with friends and community — to celebrate together, to learn together, to find comfort and to talk to God. Through Jewish rituals and customs, and the wisdom of our Torah and of our sages, our synagogue can add meaning and depth to our lives. As the Rabbi, I aspire to help nurture such an environment where all these things, and more, can take place. People come to Temple Sholom services for different reasons. For some, it is a time to relax and leave cares and worries at the door of the sanctuary. For others, it is a time to reflect on the past and envision the future. And for others, it is a time to talk to God. At our synagogue, I strive to make the worship experience meaningful for all different types of seekers. Yet, more than belief, Judaism is a religion of action. It is not enough to offer prayers and study about Judaism, but it is our obligation in the world as Jews to make a difference, to make the world a better place because we have been part of it. The Mitzvot of the Torah enjoin us to feed the hungry, c lothe the naked, to look after those who are less fortunate, and to pursue justice and peace. But it is too much for each of us to do alone.Working together, members of Temple Sholom find ways to perform acts of G’milut Hasadim, adding to the greater sense of purpose of our synagogue and helping us feel connected to the world around us. Whatever your reason, I invite you to visit us. Join me and our members to create a holy space, in which the ideals of Judaism thrive, and the spirit of community inspires us to make the synagogue the best place it can be. During 2016 High Holidays, Rabbi gave four sermons, read them here: Do You Live Your Resume or Your Eulogy? — What Will Guide Your Vote. — How To Grow Old Without Kvetching: A Spiritual Approach to Aging. — Not in God’s Name: Confronting Religious Violence. 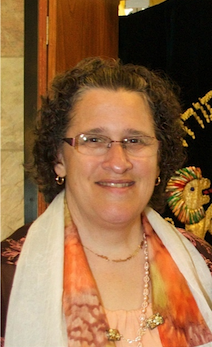 Rabbi Michele Brand Medwin, D.Min. is celebrating 18 years as a rabbi and 10 years as the rabbi of Temple Sholom in Monticello. She grew up on Long Island in Elmont, NY. Inspired by a family trip to Israel, she returned to Israel between high school and college to live, work, and study Hebrew on a kibbutz. Rabbi Medwin, D.Min. has always had an interest in theology and spirituality. She is the author of two books: A Spiritual Travel Guide to the World of God – Part I: Packing for the Journey, and Part II – God Questions on the Journey. She also had two articles published in Reform Judaism Magazine. The first is called, “Alzheimer’s and the Soul,” which later became a chapter in the book, Broken Fragments: Jewish Experiences of Alzheimer’s Disease through Diagnosis, Adaptation, and Moving On. The second article was called, “Glimpses into the Afterlife” which compared Near Death Experiences to the Talmudic and Kabbalistic ideas of the afterlife. In addition she wrote “Mi Sheberach Prayer for Chronic Illness” that was published in Mishkan R’fuah: Where Healing Resides. On a personal note, Michele met her husband Steve when they were students at Cornell University. They were married right after graduation in 1976. Michele is the proud mother of Dan and Rachel, mother-in-law of Lydia and Michael, and Savta to her grandchildren, Zimra, Gavi, Teddy, and Jasmine.